Today we had our last family Christmas get-together at our house. When Joe’s mom offered to bring a lasagna all of I sudden had a big craving for a pasta dish myself. It’s been a while since I made a pasta meal. Mostly because I couldn’t find a good vegan substitude for cheese, and pasta without cheese is like PB with no J. We finally discovered a vegan “cheese” which is totally worth trying. I have been hearing about Dayia since visiting Vancouver in August of this year. This is a Canadian company, they have been selling their “cheese” in the US for quite some time. 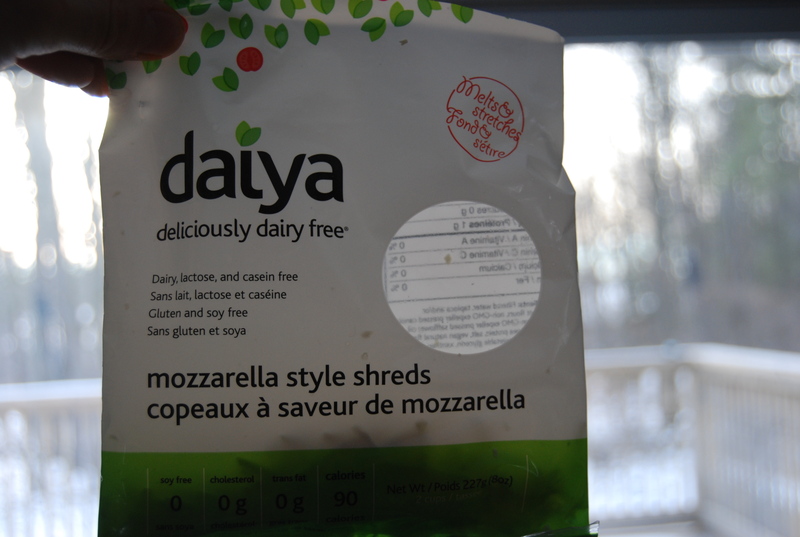 Apparently they had labeling issues here in Canada, however, all that has been solved now and you can purchase Dayia in most health food stores across Canada. Preheat oven to 325°. Oil a casserole dish. Cook pasta according to package directions, drain and rinse. 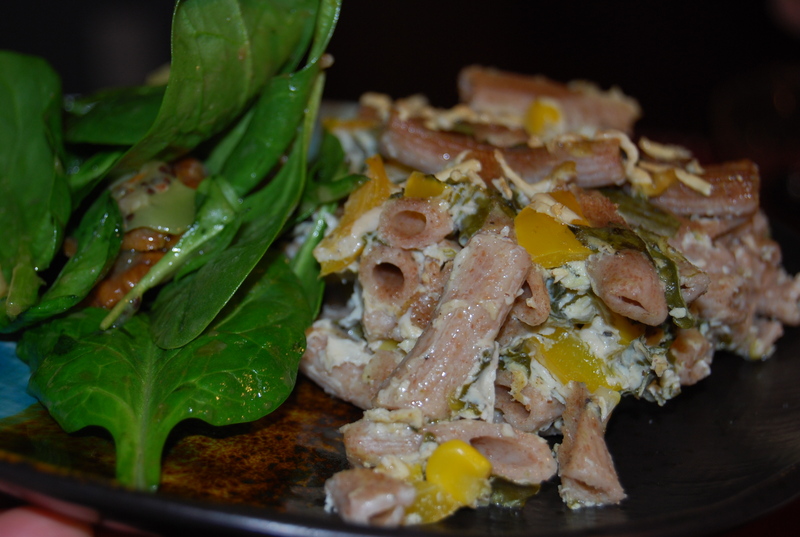 In a large bowl, mix pasta, chopped bell pepper and spinach, set aside. 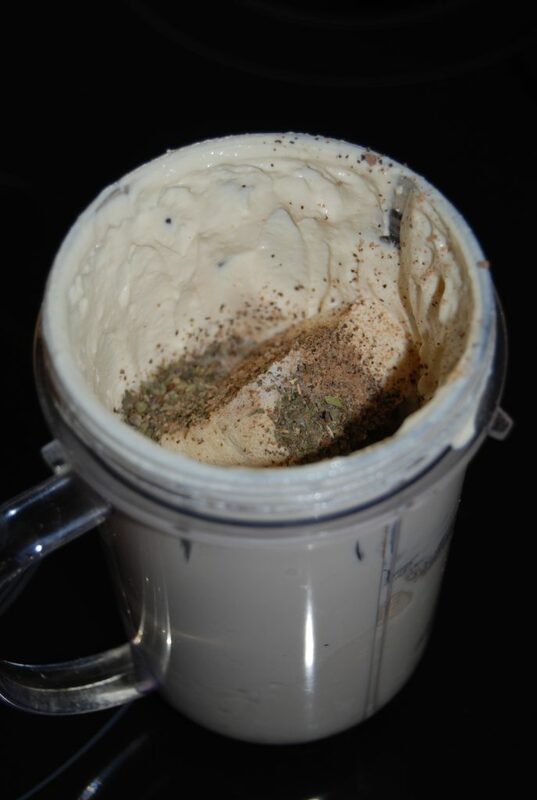 Puree tofu in a magic bullet or blender together with garlic, basil, salt, black peeper and nutmeg. Add tofu mixture to pasta bowl, gently stir until well combined. Transfer to prepared casserole dish. 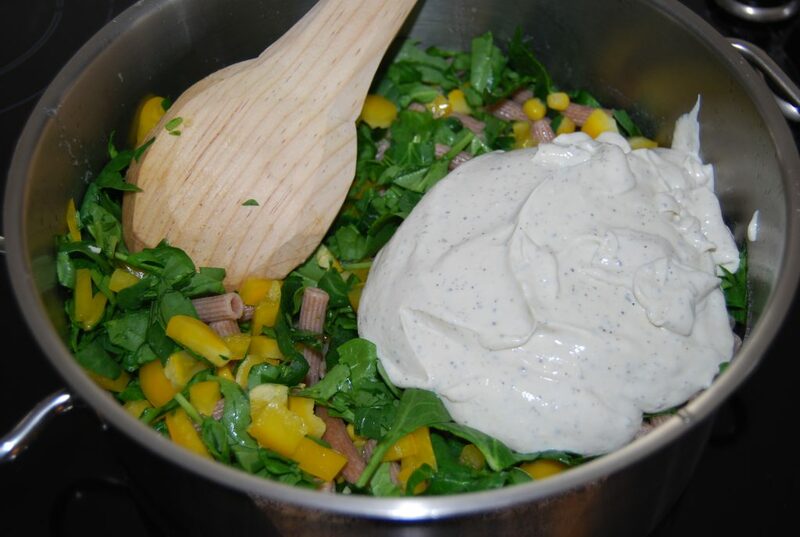 Smooth top and sprinkle with Daiya. Bake until golden 40-50 minutes. Let stand 10 min before serving. 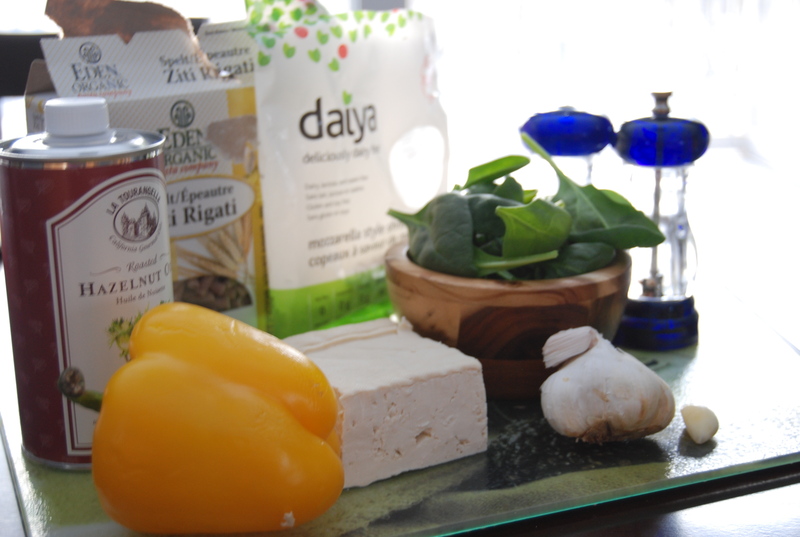 A lot of our listeners have been asking about healthy meals on a budget. Well this recipe definitely fits this category. This dish serves 8 people with the budget of only $1.28 per serving. And here’s the kicker…I used all organic ingredients. Ahhh…. 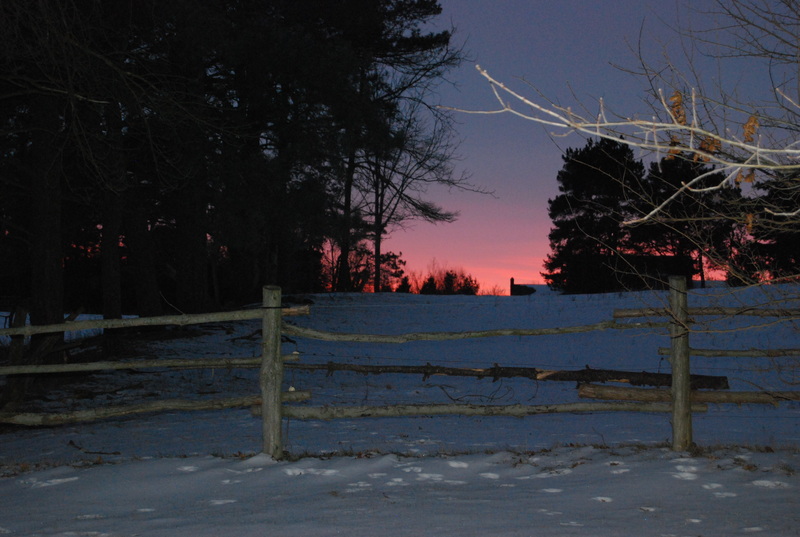 I love the beautiful evening country sky. Time to clean up and relax while looking at this out the window. Good night everybody. Talk to you soon. 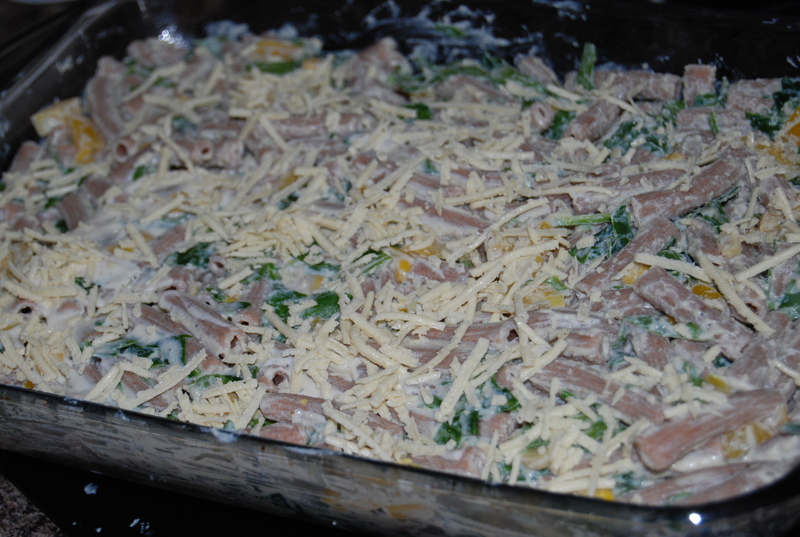 Lee and I had the pleasure of partaking in this family dinner, and I am sold on this casserole! It was delicious and the spinach salad was the perfect companion. We had a great evening picking your brains and look forward to more great meals and conversation! I always feel inspired after spending time with you two! !